The Résumé / CV Analyser is the ultimate job-seeker solution to help put your Résumé / CV in front of a hiring manager. It analyses the job description text to your Résumé / CV, to highlight all the missing keywords in seconds to speed up your job-search efforts and to make sure that your CV gets the best possible chance that it needs, to get you an interview and the job offer. In today's competitive job market the latest recruitment ATS Applicant Tracking System technology is used most companies to filter out candidates Résumés and CVs that have missing crucial keywords, which are always in the job description. 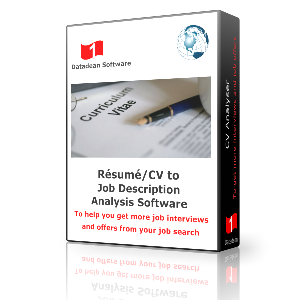 The free download allows you to use the software fully to analyse 10 job descriptions for 1 Résumé / CV, or 10 Résumé / CVs for one job description. The full version allows you analyse UNLIMITED Résumé / CV's and job descriptions so that you can apply for more and more jobs, saving you hours of time..